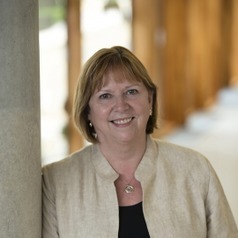 Wendy Hall, DBE, FRS, FREng is Professor of Computer Science at the University of Southampton, UK, and was Dean of the Faculty of Physical Science and Engineering from 2010 to 2014. She was Head of the School of Electronics and Computer Science (ECS) from 2002 to 2007. She is now a Director of the Web Science Institute. She became a Dame Commander of the British Empire in the 2009 UK New Year's Honours list, and was elected a Fellow of the Royal Society in June 2009. She was elected President of the Association for Computing Machinery (ACM) in July 2008, and was the first person from outside North America to hold this position. Until July 2008, she was Senior Vice President of the Royal Academy of Engineering, was a member of the UK Prime Minister's Council for Science and Technology, and was a founder member of the Scientific Council of the European Research Council. She was President of the British Computer Society (2003-4) and an EPSRC Senior Research Fellow from 1996 to 2002.